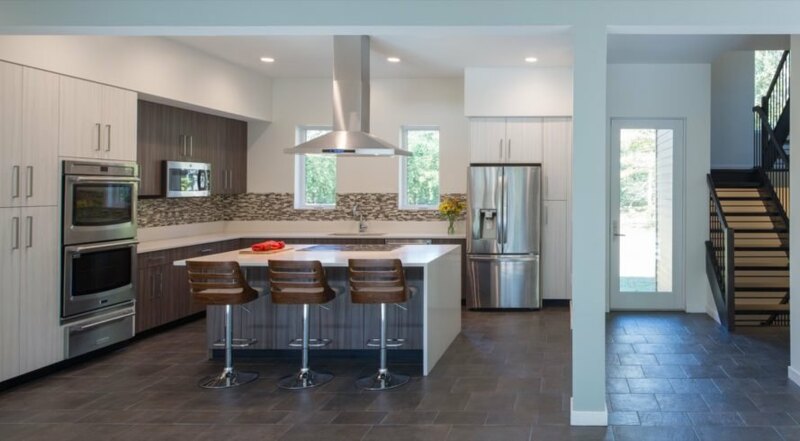 Set on the edge of a forest conservation area in central Maryland, the Forest House is a contemporary home integrated with a wide variety of energy-efficient features. 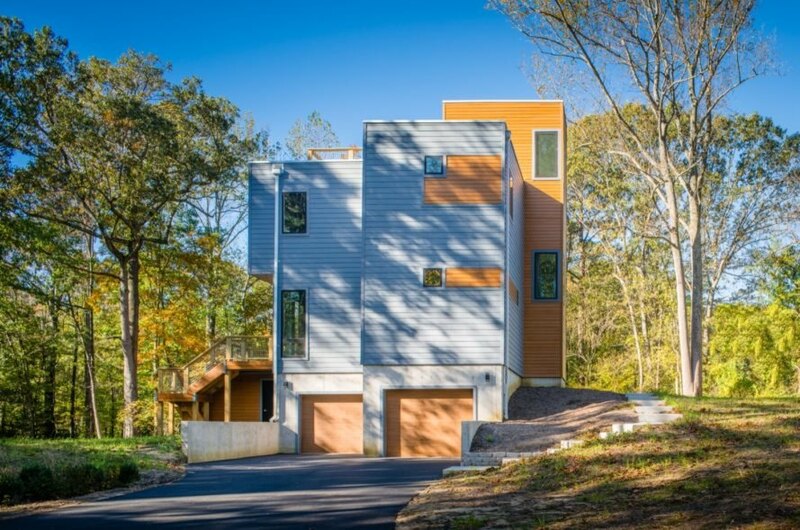 Local design firm Gardner Architects LLC designed the spacious home that responds to passive solar principles and rises to the height of the tree canopy to capture surrounding views. 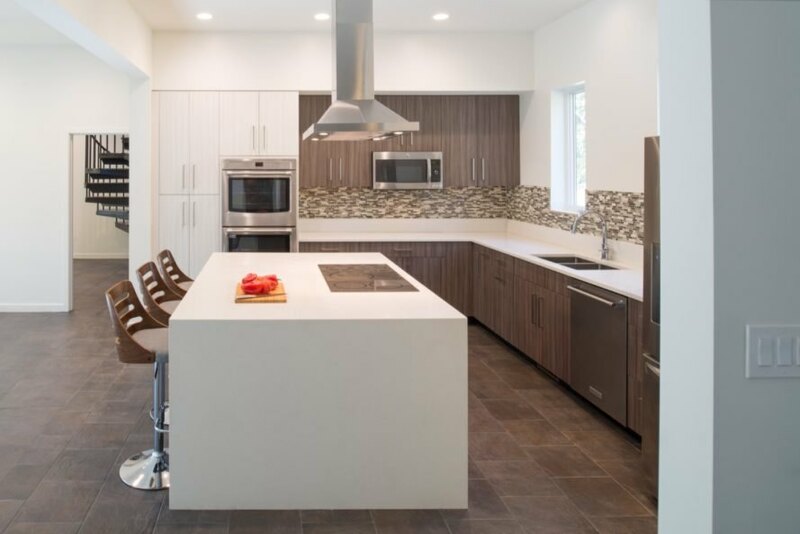 The sustainable technologies include geothermal energy, rooftop solar panels and rain gardens, as well as low-tech solutions like stack ventilation. Commissioned by clients who wanted a spacious home yet desired a sustainable footprint, the Forest House spans 3,500 square feet across three levels. 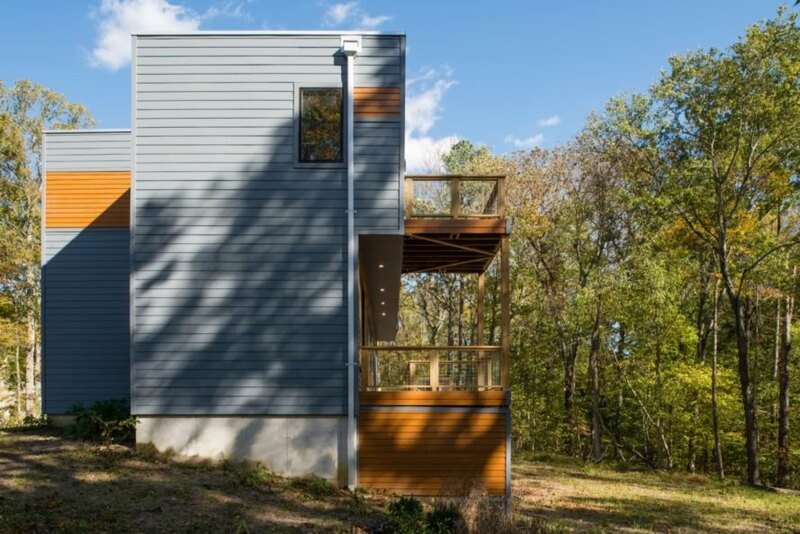 By building upwards on the 0.6-acre wooded property, Gardner Architects sought to create a compact building footprint that would minimize site disturbance. The Forest House embraces the outdoors with covered balconies, a large roof deck that overlooks the forest, and ample low-U value glazing that wraps around the south side to maximize solar gain in winter. The upper level is cantilevered over the glazed south facade to provide shade from the harsh summer sun. The home was constructed with framing panelized off-site in a factory to reduce material waste as well as onsite construction time. The energy-efficient building envelope is bolstered with rigid insulation on the exterior to prevent thermal bridging. In addition to natural daylighting that’s brought in through the skylights and other glazed openings, the openings were carefully placed in concert with an open stair tower so as to promote stack ventilation that brings in cooling breezes. 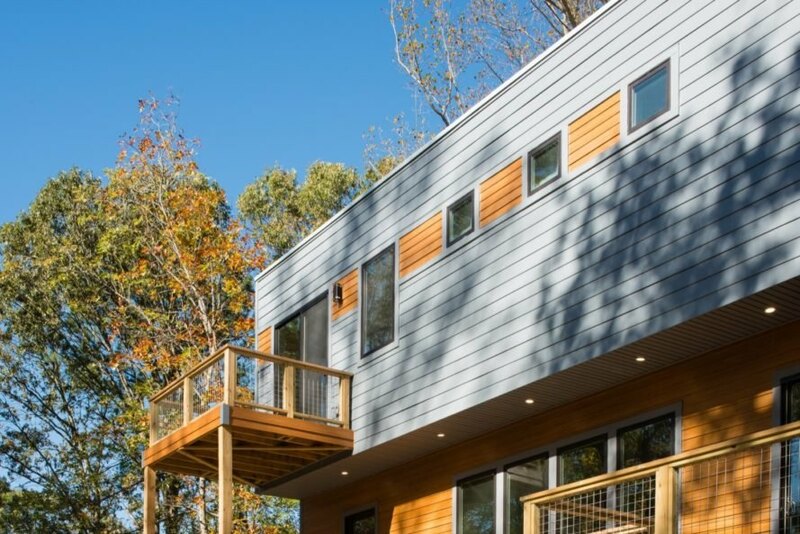 The Forest House is powered with a ballasted solar array that sits atop the roof deck. A ground source heat pump provides heating and cooling. To further reduce energy needs, the house is equipped with central DC-powered low voltage LEDs that can be controlled remotely. The project was completed in 2016. 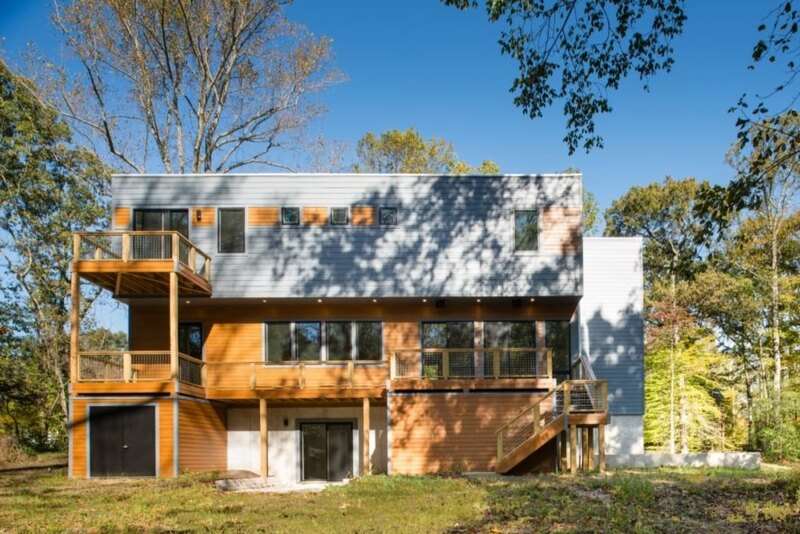 Gardner Architects LLC designed the Forest House to include many sustainable features, such as rooftop solar, rain gardens, and geothermal power. The framing was panelized off-site in a factory to reduce material waste as well as onsite construction time. The south side of the home is mostly glazed to bring in solar gain in winter. Energy-efficient LEDs were installed throughout. The balcony comes with an operable canopy to provide shading. Geothermal energy provides heating and cooling. A rain garden by the side of the home helps manage stormwater runoff. A diagram of the sustainable features.